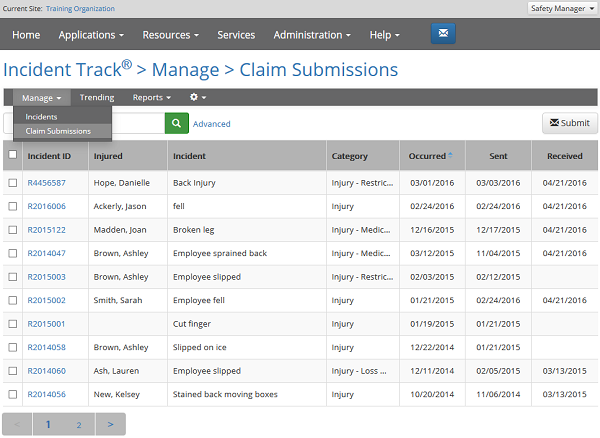 Incident Track can be configured to submit claims electronically to your insurance carrier. Contact your provider if you would like to enable this feature. 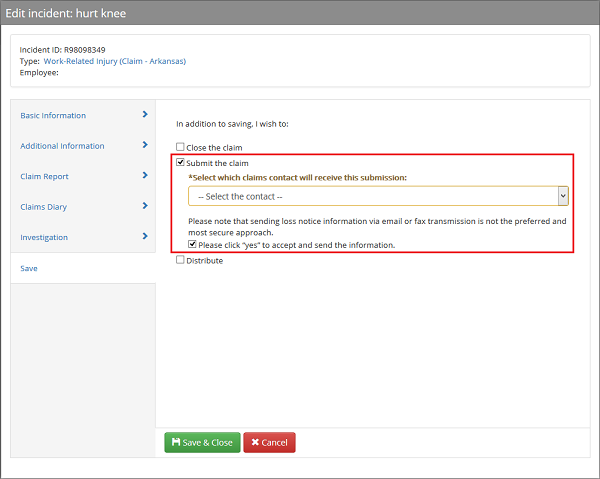 When claim submissions are enabled, users will see an option to Submit the claim on the Save tab of the Incident Editor. If your account is set up to submit to multiple carriers, a dropdown will allow you to choose the appropriate carrier. You must accept the submission method disclaimer before the claim can be submitted. By default, the primary user of an account will receive claim status update emails. Distribution of these emails can be configured using these steps, if desired. A notification email will be sent to confirm that the claim has been submitted and another will be sent when the claim has been downloaded by the carrier. You can review the status of all of your submitted claims from within Incident Track and re-submit them to the carrier, if necessary. To do so, select Claim Submissions from the Manage menu in the Incident Track navigation bar. The report can be sorted by any column. The Sent column will display the date of the last submission only, if the claim has been submitted multiple times.